Mazda's stylists, lead by Chief Project Engineer Akio Uchiyama, actually focused more on the Porsche 944 for their inspiration in designing the FC because the new car was being styled primarily for the American market, where the majority of first generation RX-7's had been sold. This strategy was chosen after Uchiyama and others on the design team spent time in the United States studying owners of earlier RX-7's and other sports cars popular in the American market. Several leading car magazines at the time also selected the convertible as the best ragtop available on the market, and it was the star of auto shows around the globe. The convertible's well orchestrated introduction caused a notable public sensation and heavy demand for these vehicles. 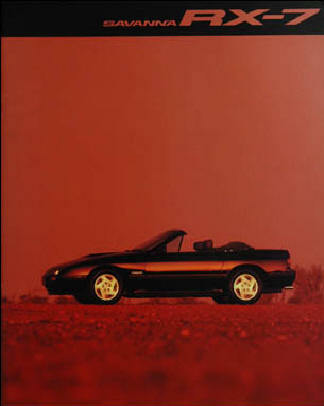 Despite production ceasing in October 1991, Mazda built a limited run of 500 convertibles for 1992 as "specials" for the domestic market only. In Japan, the United Kingdom, and other regions outside the US, a turbocharged version of the convertible was available. Mazda was most proud of the Convertibles patented wind blocker for reducing the buffeteing of air coming from behind your head with top down, this was the idea of RX-7 Chief Engineer Takaharu Kobayakawa. The wind blocker simply gets the air to curl around further aft of the occupants heads and has been copied by manufacturers around the world including Porsche and BMW. In 1988, a convertible version started production in atmospheric and turbocharged form, proving an instant success. This sleek, clean-lined model featured a cabriolet design and was introduced to the American market in splashy television advertisements. The designers had a list of intended winning characteristics. They wanted steep windshield rake for aerodynamics, opting for 63.5 degrees. Exterior designer Takashi Ono wanted an ultra low bonnet but even with the small rotary engine he got a bonnet an inch higher than requested. Originally a currently fashionable (in Japan) glass concealed A pillar was specced but fell prey to cost and sealing problems. The car would have a short rear overhang, hidden drip rails and a look of big wheels, an idea ahead of its time! The front air dam was moved forward and the designers were finally granted a glass liftback rear screen, the largest piece of automotive glassware ever made in Japan. The attention to good aerodynamics even extended to flush door handles, a rear deck spoiler and deflectors ahead of the wheels, details that would pay off in an aerodynamic efficiency of 0.29 CD not that long after Audis ground breaking 100 executive saloon. The nose was intentionally specified to be "soft" achivied with a secret formula R-RIM (fibre glass reinforced reaction injection moulded urathane).